has been the girls that have dominated the court in Louisburg. performances the last two years. want to get involved in the fun. community and the Wildcats are already off to a good start. match Wednesday and the boys look great right now. picking the game up very well. for the opportunity to compete with others from the same town. and the Wildcats are doing all they can to try and get the word out. volleyball in the high school setting. season and it is hope to avenge that tough loss in front of its home crowd. Pittsburg State junior Lauren Dunn became the school record holder last month in service aces. 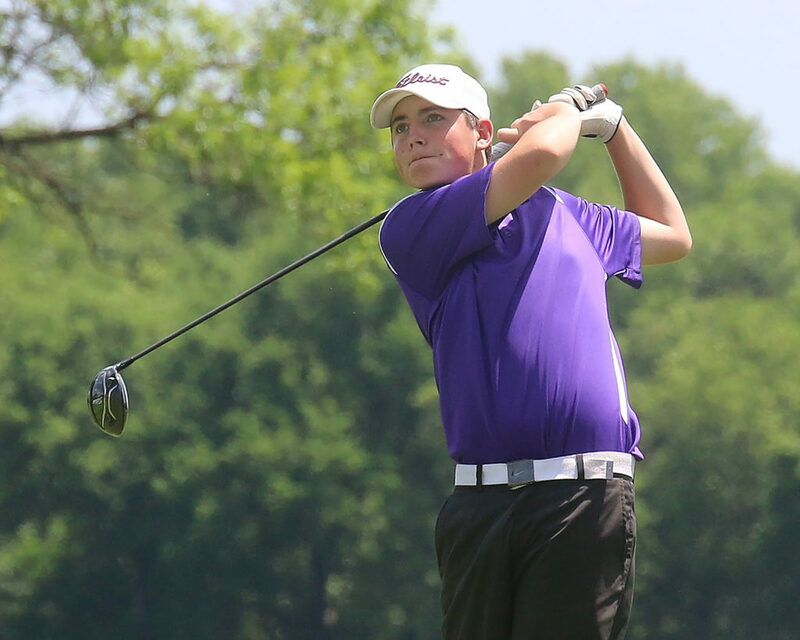 Dunn, who is a Louisburg High School graduate, also earned All-MIAA honors. PITTSBURG – Although it wasn’t the year she was hoping for as a team, Lauren Dunn personally had a season to remember for the Pittsburg State volleyball program. Dunn cemented her name in the Pittsburg State record books when she became the single season-record holder for service aces with 59 when the Gorillas squared off with Emporia State on Nov. 2. She would finish the year with 60 aces overall. It was an impressive feat and Dunn, a 2016 Louisburg High School graduate, didn’t have much of a clue that she was close to any kind of record. As for the Gorillas themselves, they finished their season with an 18-13 record and a 7-11 mark in the MIAA. Dunn, a junior, served as a defensive specialist for Pittsburg State and led the team in a couple different categories. Along with service aces, she also led the team with 456 digs and averaged 4.07 digs per set. 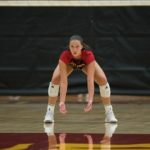 She played in all 31 matches for the Gorillas, but that 31st match was her last as a collegiate volleyball player, despite having one more year of eligibility remaining. Dunn certainly left the Pitt State program on a high note as she also received postseason honors for her performance. She was named to the All-MIAA honorable mention team as she led the MIAA in service aces and was ninth in the conference in digs per set. Dunn was also recognized for her work in the classroom as she was recently named as an MIAA Scholar Athlete and to the MIAA Academic Honor Roll. To qualify as a Scholar-Athlete an individual must have a grade point average used by the institution for purposes of NCAA academic certification of 3.50 at the certifying member institution. They must also have at least two terms of attendance at the certifying member institution, excluding summer terms. If competing in a championship sport of the MIAA, the student-athlete must earn All-MIAA honors. The honors were great for Dunn to receive, but she would have liked to play a little bit longer with her team. “Our overall season was good, but the team had more room for improvement,” Dunn said. “We had a winning season, which hadn’t happened for a while, so that is good. Being mentioned as all-conference is a big honor. I’m glad my hard work paid off and it was awesome to be recognized. Louisburg seniors Carson Buffington (left) and Anna Dixon share a quick laugh during the small class match of the GKCVCA All-Star Match on Nov. 18 at Avila University. 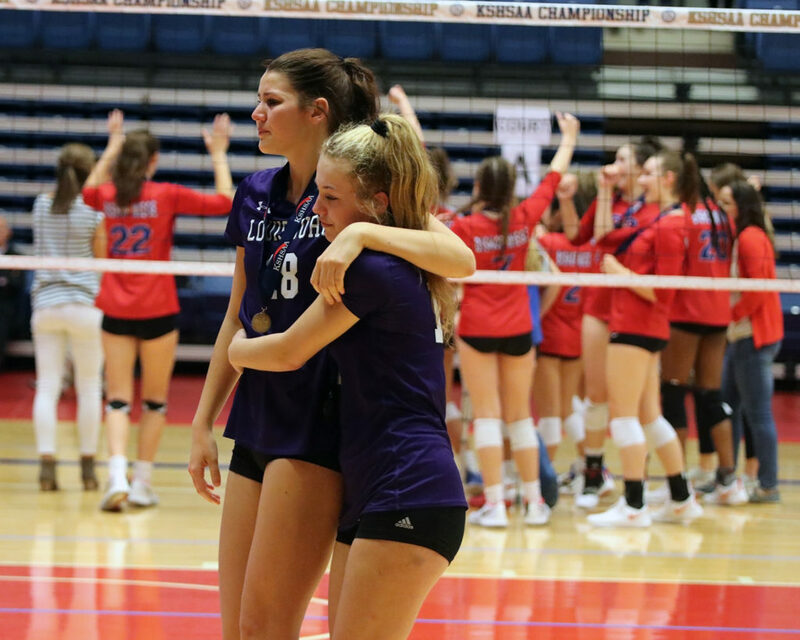 Louisburg seniors Carson Buffington and Anna Dixon thought their days of playing volleyball together were over following the Lady Cats’ loss to Bishop Miege in the Class 4A state championship match last month. It was difficult moment for both players to comprehend as they have played on the Lady Cat varsity team together the last three seasons and their final match ended in defeat. Instead, both girls received one more opportunity to take the court together one last time on Nov. 18 when they were chosen to participate in the 22nd Annual Greater Kansas City Volleyball Coaches Association MO-KAN All-Star Match. 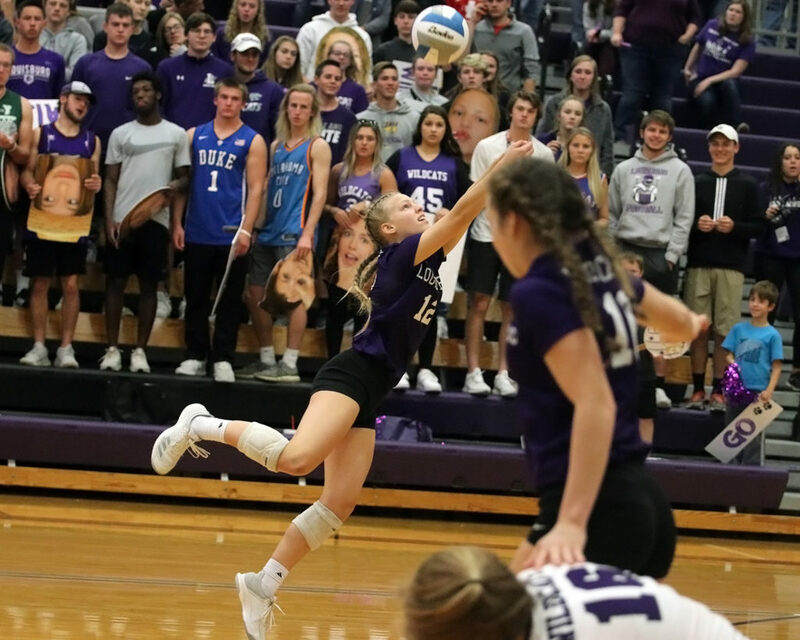 Dixon and Buffington were selected to represent team Kansas in the small-class match at Avila University following their good performance in the 2018 season. Carson Buffington records a kill during the small-class all-star match at Avila. The result didn’t go as the two would have hoped. Kansas took the first set 25-20, but Missouri bounced back to win the match 25-20 and 25-21. Despite the loss, it was a still a great experience for both as they got a chance to team up with some of the best players in the Kansas City area. Dixon provided Kansas with a spark in the first set with three kills and a block and she played all six rotations for much of the match. Buffington, who played as a right side hitter, also registered a pair of kills in the second set. Senior Anna Dixon sends a shot over the net during the GKCVCA All-Star Match on Nov. 18. Team Kansas was coached by Kathleen Rush, the head coach of Bishop Miege, and she ran a practice the day before the match to help the girls get acclimated to each other. Dixon agreed, as she came up against foes that she has competed against over the last several years from both sides of the state line. “There were a lot of great athletes, especially ones that I have come up against during the club season, so it was fun to play with and against a lot of them,” she said. Louisburg senior Anna Dixon (center) made it official on Nov. 14 when she signed her letter of intent to play volleyball at Kansas State. Seated (from left) are Louisburg head coach Jessica Compliment, Anna’s parents Jerry and Beth Dixon and Louisburg assistant coach Leanna Willer. Since giving her commitment to Kansas State two years ago, there was plenty of time where Anna Dixon could have had second thoughts about playing for the Wildcats. It just never happened – not even a little. Dixon was all in. 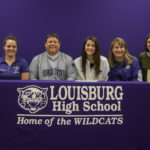 The Louisburg senior made it official on Nov. 14 when she signed her letter of intent to play for Kansas State next season in front of a room fully of family, friends and teammates. 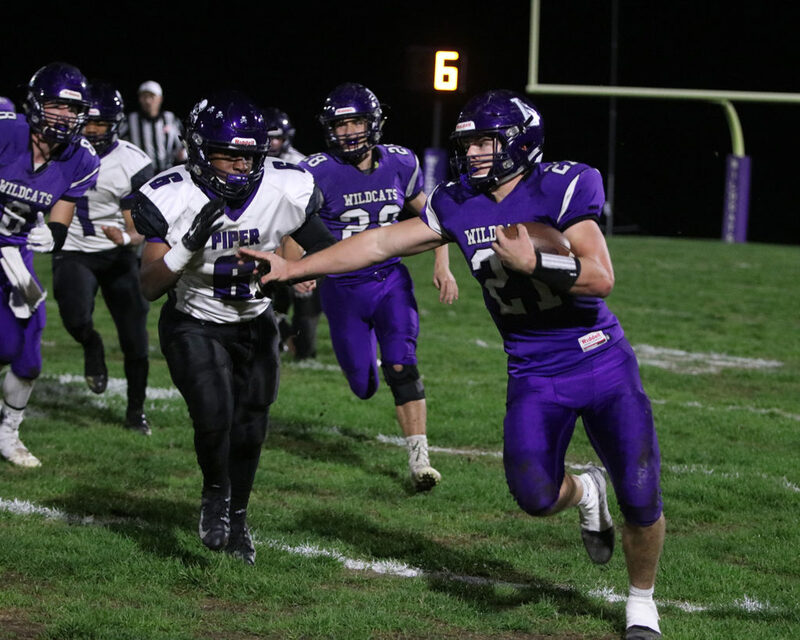 Dixon will trade in one Wildcat uniform for another. “It hasn’t really hit me fully yet,” she said. “It has been my dream since second grade, not only to play college volleyball, but to play volleyball at K-State. I am still trying to soak it all in. 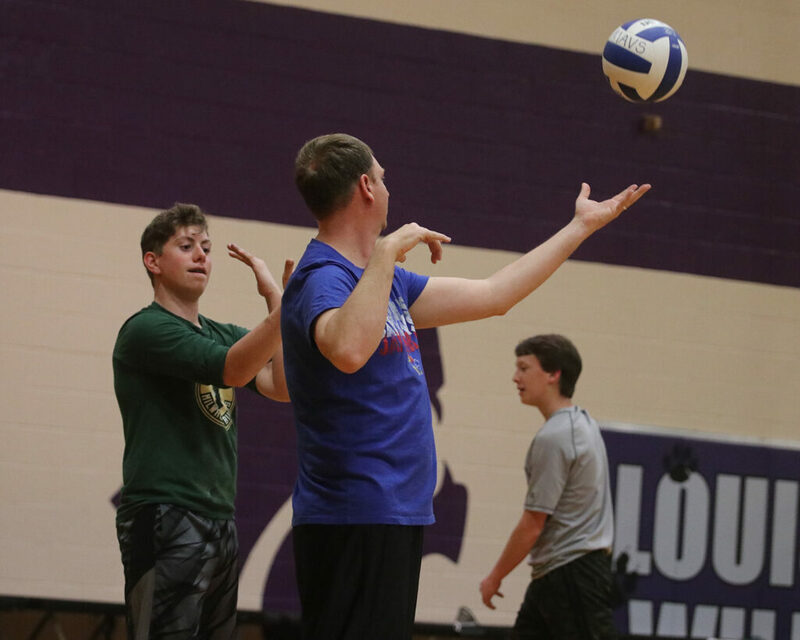 Dixon had a prolific career for the Louisburg volleyball program. She was a two-time Class 4A Player of the Year and earned first team all-state and All-Frontier League honors on several occasions. Earlier this month, she was an honorable mention selection to the Under Armour All-American Team. She helped the Lady Cats to two state runner-up appearances and led the Lady Cats in kills with 584 in 105 sets played. She also finished with 325 digs, as she played all six rotations and also had 50 aces and 42 blocks. In her four years with the program, Dixon finished with 2,003 kills, which would place that total among the best the school has ever seen. Playing Louisburg volleyball is a family tradition as she grew up watching her two older sisters, Katie and Sydney, play in the program. Her mom Beth Dixon and aunt Amy Goode, also played for Louisburg and went on to collegiate careers at Wichita State and Kansas State, respectively. Anna Dixon finished her high school career as a two-time state player of the year and recorded more than 2,000 kills. Now Dixon will move on to the Division I level where she will compete against some of the nation’s best volleyball players on a regular basis. It is that competition that attracted Dixon to the Kansas State program, along with environment that surrounded the team. Kansas State is currently 14-12 on the season, including a pair of wins over rival Kansas, but the Wildcats will be losing seven seniors off its roster for next season. That leaves an opening for Dixon to come in and play right away. “Anna is a high-level recruit with great size and athleticism at the outside hitter position,” K-State coach Suzie Fritz said in a release. “She has the potential to contribute early on in her career as she is a strong presence at the net, both offensively and defensively. She has a nice combination of size, power, athleticism and control as an attacker and can play physically at the net. She will be graduating from Louisburg this December and will report to Kansas State shortly after to get her college career started and get acclimated to the program. It has been a long journey for Dixon to reach her dream of playing at Kansas State – one that started in the second grade and that saw countless hours in the gym working to get better. 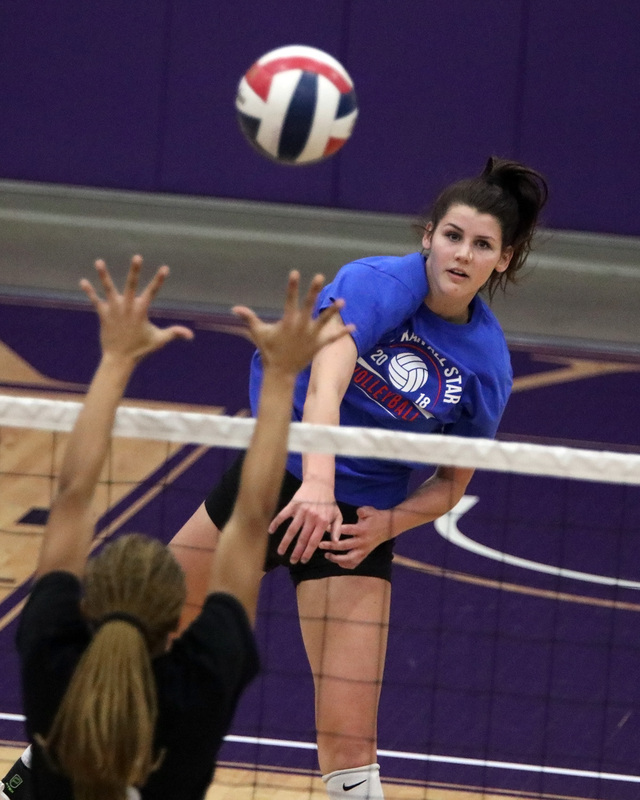 Louisburg senior Anna Dixon was recently named as the Class 4A Player of the Year by the Kansas Volleyball Association and was also named to the all-state and All-Frontier League first teams. 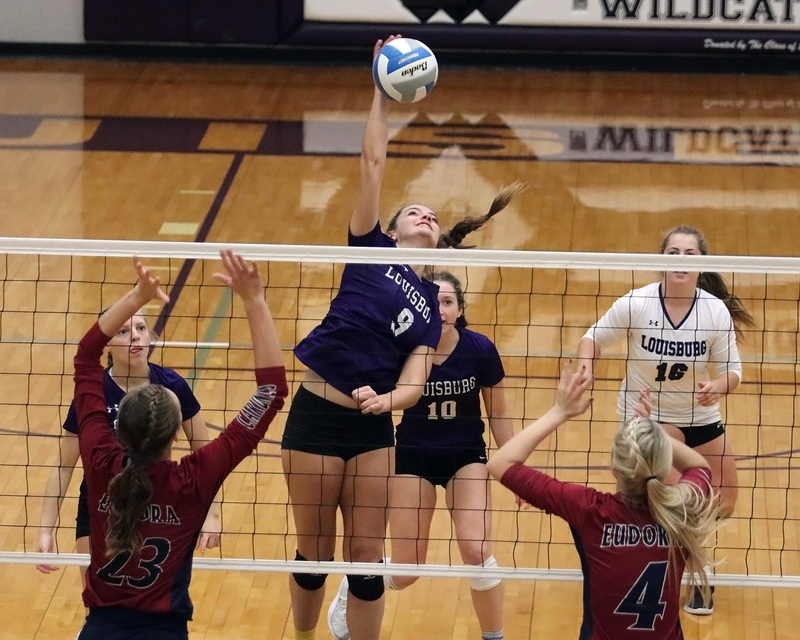 The 2018 season was another one to remember for the Louisburg High School volleyball team. 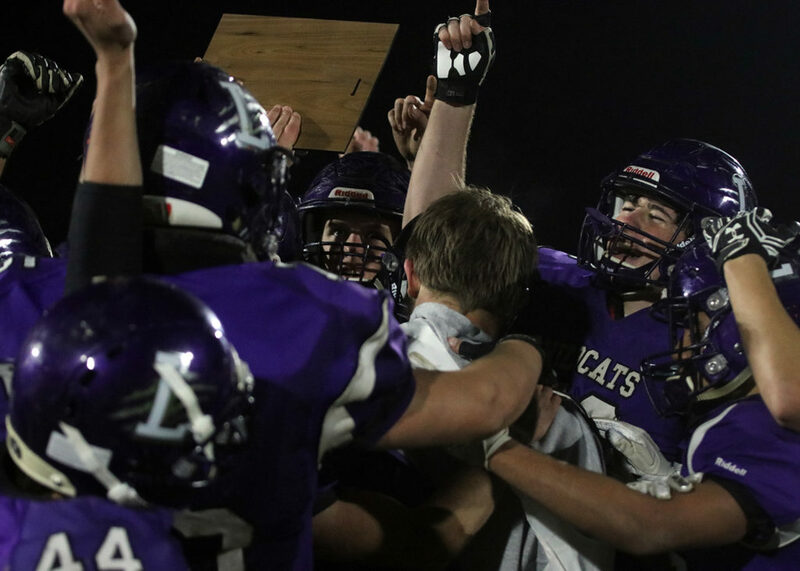 Louisburg rolled to a perfect Frontier League season, which resulted in its first league title since 2015, and went on to finish runner-up in Class 4A for the second consecutive season. So it is only fitting the honors are now rolling in for the Lady Cats and it starts with senior Anna Dixon. It was the second year in a row Dixon was named player of the year, as she had to share the honor last season with Rose Hill’s Gracie Van Driel. “It is an awesome honor and it feels great,” Dixon said of the award. “I didn’t mind sharing it with Gracie at all last year and she is such a great player too and so are all the other players in 4A. There was some great talent this season. You could tell that by how close all the matches were at state. It feels great to be recognized with that two years in a row. 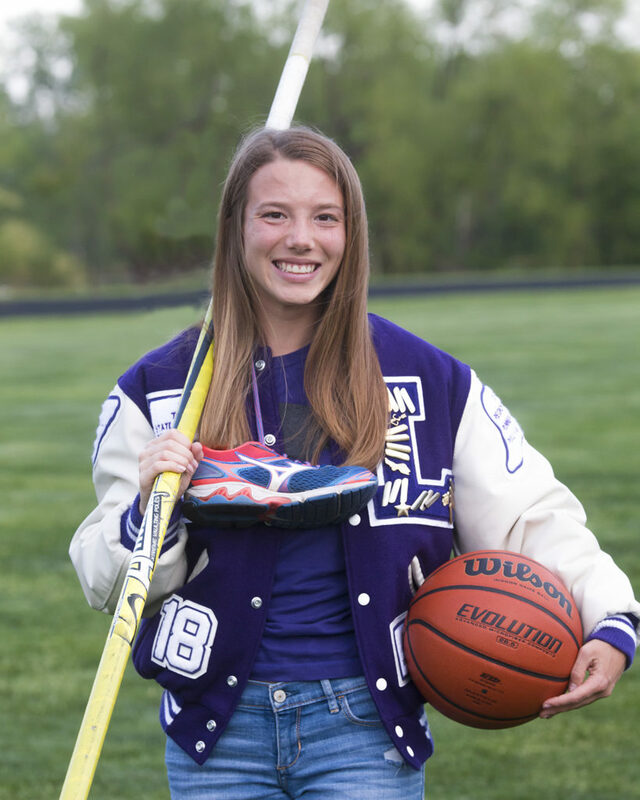 The honors certainly didn’t stop there as Dixon was all named to the All-Frontier League first team as she helped guide the Lady Cats to an undefeated league season. Dixon led the Lady Cats in kills with 584 in 105 sets played. She also finished with 325 digs, as she played all six rotations and also had 50 aces and 42 blocks. “Anna had another great season for us,” Louisburg coach Jessica Compliment said. “She’s a dynamic player on the court and one that is fun to watch. She truly enjoys playing, and she brought her love of the sport every day to practice and to every match. Between she and Carson (Buffington), they did a great job leading the team. They both stepped up and made huge plays when we needed it. As much praise as Dixon received for her performance, the rest of the Lady Cats weren’t able to crack the first team all-league honors. In a season where Louisburg lost just one set all year in league play, Dixon was the lone player to earn first team honors. Senior Carson Buffington and freshman Rinny McMullen were recognized as second team selections, while juniors Haley Cain, Reilly Ratliff-Becher and Riley Kallevig were named as honorable mentions. Carson Buffington (left) and Rinny McMullen (right) were named to the All-Frontier League second team. Eudora, which finished second in the league and never took a set from Louisburg, earned three first-team selections. Bonner Springs ended its year with a below .500 record, but had two first-team honorees. “It would have been nice to see each of those players and a few others recognized higher within league,” Compliment said. “I may be biased, but I think the players on this team were special and some of the best in the area. Their stats may not have been higher than others, but the balance and consistency they brought to the team this year was huge. Buffington, who was the team’s setter the last two years, was named to the second team as a hitter as she made the move to a new position this year. She finished the season with 130 kills. As for McMullen, she shared setting responsibilities with fellow freshman Davis Guetterman, and McMullen led Louisburg in assists with 638, to go along with 202 digs and 40 aces on the season. “I think it’s great to see Carson get second team, especially since I changed up her position this year,” Compliment said. “Carson didn’t bat an eye and never backed down from a challenge. We started working on special plays, and Carson was excited to try something new. Some players would be hesitant to try something new, especially their senior year after they’d had success somewhere else. I was proud of how Carson took on her new position on the team. She was welcoming and a great leader to the two freshmen setters. (From left) Haley Cain, Reilly Ratliff-Becher and Riley Kallevig were honorable mention all-league selections. Cain and Kallevig were named to the honorable mention team as hitters, while Ratliff-Becher was selected as a libero. Cain had a big season in the middle for Louisburg as she was second on the team with 191 kills. She also finished with 41 blocks and 42 aces on the year. 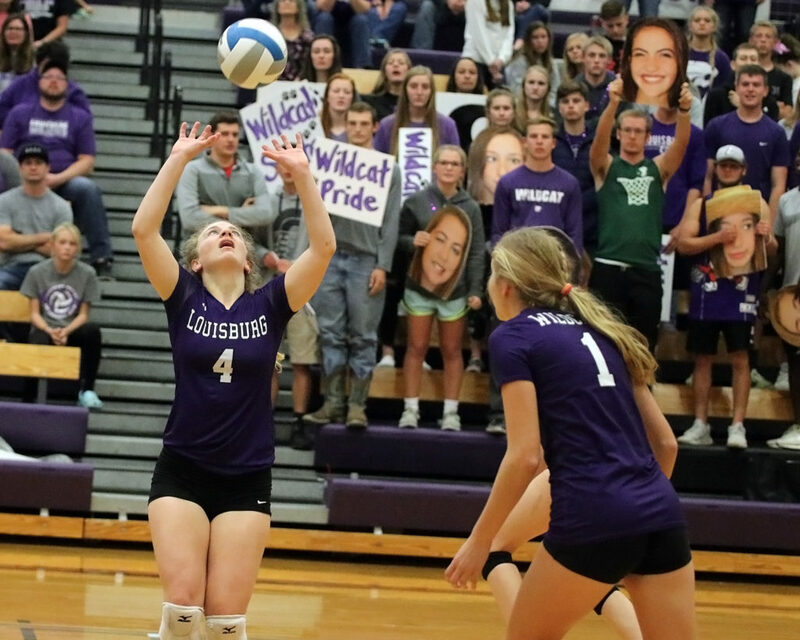 Kallevig, who played all six rotations for Louisburg, led the Lady Cats from behind the service line with 76 aces and was second on the team in digs with 325. She also finished with 105 kills. As for Ratliff-Becher, she became a leader in the back row in her first season as the team’s libero. She finished with a team-high 330 digs and also added 21 aces. Anna Dixon, a senior at Louisburg High School, was recently named to the Under Armour All-American team as an honorable mention. Dixon tallied 584 kills on the season to lead the Lady Cats. 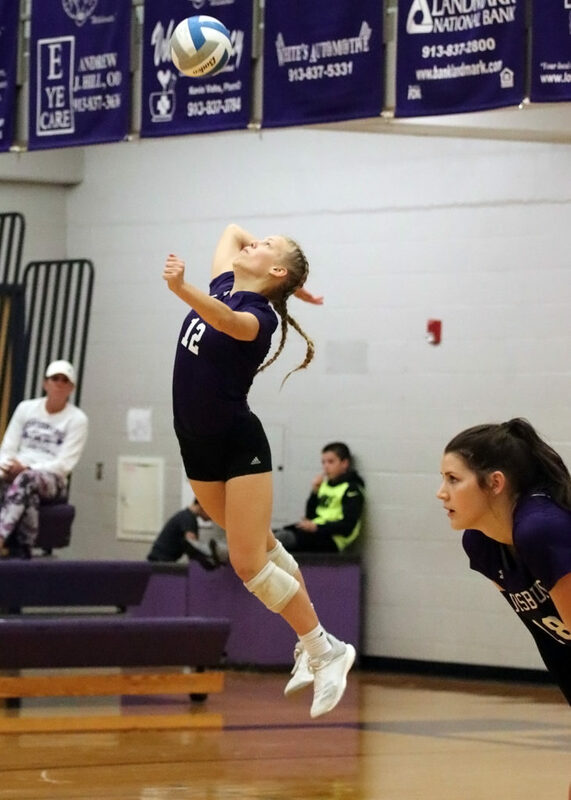 Louisburg’s Anna Dixon has solidified herself as one of the top volleyball prospects in the state of Kansas after her performance this past season. The Lady Cat senior is also considered one of the best players in the nation and she was recently recognized for her efforts. Dixon was named to the Under Armour Volleyball All-American team as she received a spot on the honorable mention squad when the list was released last Wednesday. 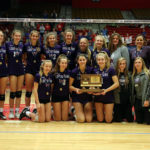 Dixon led the Lady Cats to a second consecutive runner-up finish in the Class 4A state tournament and the 6-foot-3 outside hitter was a team-leader in kills with 584 in 105 sets played. She also finished with 325 digs, as she played all six rotations and also had 50 aces and 42 blocks. 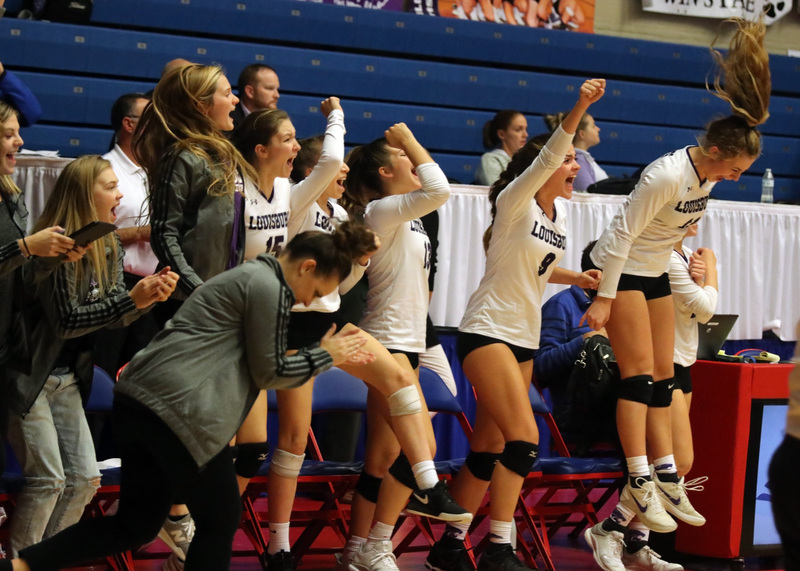 A record 793 nominations were submitted through the American Volleyball Coaches Association (AVCA) and MaxPreps, resulting in 150 All-America and Honorable Mention All-Americans. Many already committed to play collegiate volleyball at some of the top schools in the country. In 2017, Dixon was named as the Class 4A Co-Player of the Year and will be attending Kansas State on a volleyball scholarship next season. To view a complete list of the Under Armour team, click here. Members of the Louisburg volleyball team are (front row, from left) Chase Kallevig, Riley Kallevig, Anna Dixon, Carson Buffington, managers Cameron Rogers and Bailey Kern; (back row) Reilly Ratliff-Becher, Erin Lemke, Sydni Keagle, Haley Cain, Alyse Moore, Carleigh Pritchard, Rinny McMullen, Davis Guetterman, assistant coach Mary Quinn, head coach Jessica Compliment and assistant coach Leanna Willer. HUTCHINSON – The feeling was much of the same. The pride of finishing as a state-runner up was a popluar one among the members of the Louisburg volleyball team. At the same time, the frustration of taking second in state in back-to-back seasons was just as prevalent. 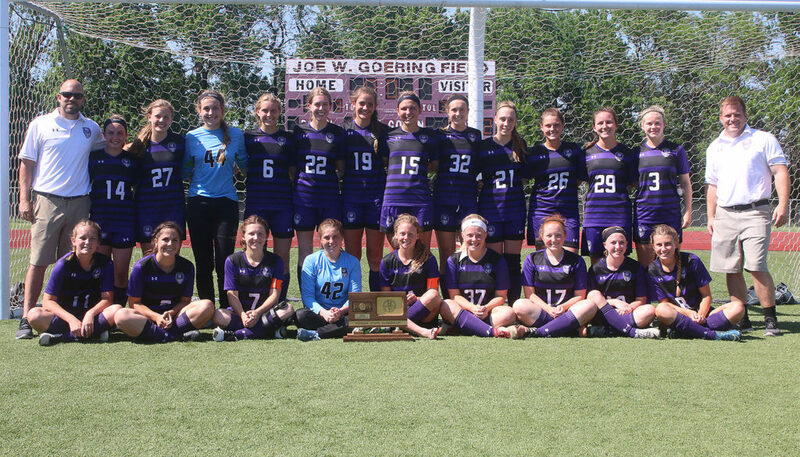 In 2017, the Lady Cats fell to Rose Hill by two points in the championship match, and fast forward to the present, they were in the same spot – holding the state runner-up trophy. 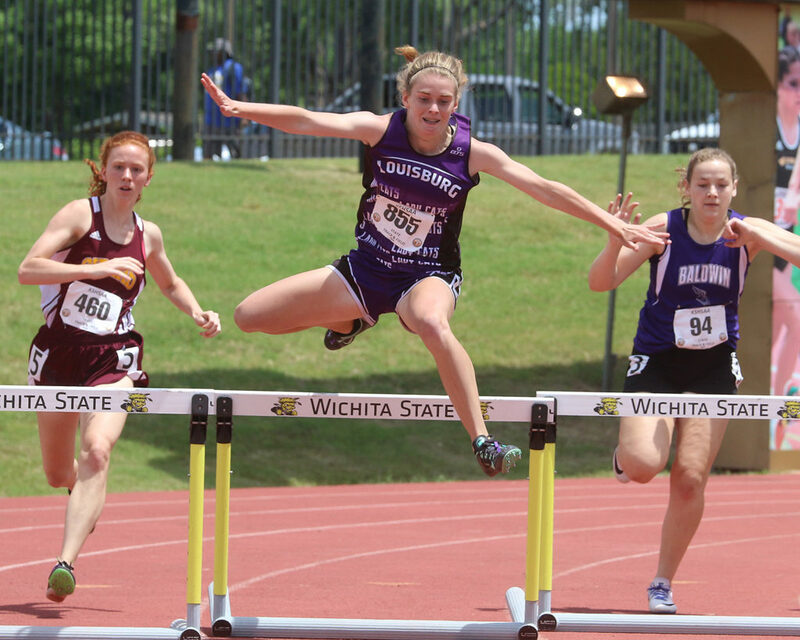 It was the 15th time in program history that Louisburg finished in the top four at state. As disappointing as that was to some, the Lady Cats also realize what it took to get to that final match. 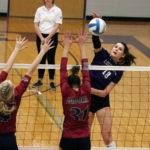 “Losing in the championship match is a terrible feeling especially since we lost in the championship last year,” Louisburg senior Anna Dixon said. 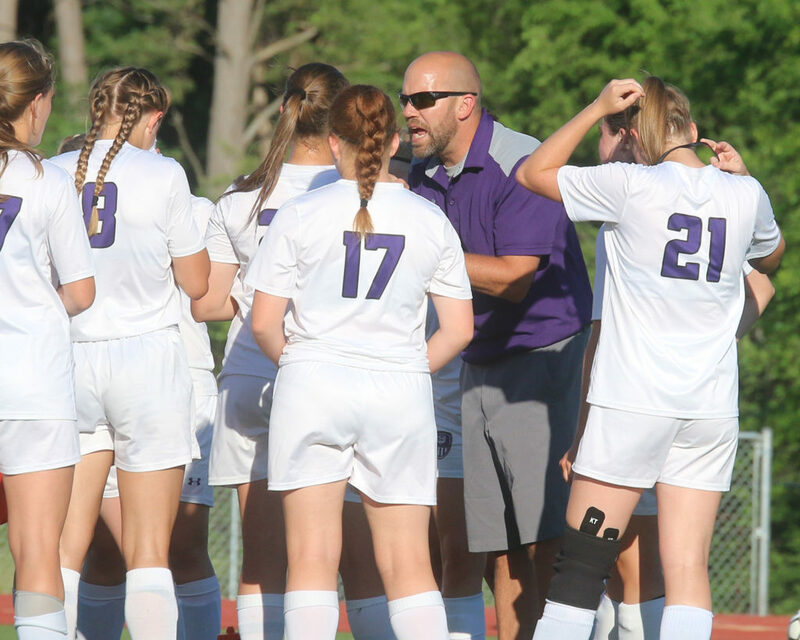 “We were all very upset, but we also had to remind ourselves that many girls or teams would have killed to even been able to compete in the state tournament. The Lady Cats faced off with Bishop Miege earlier in season, where they lost a 2-1 match to the Stags at the Ottawa Invitational. 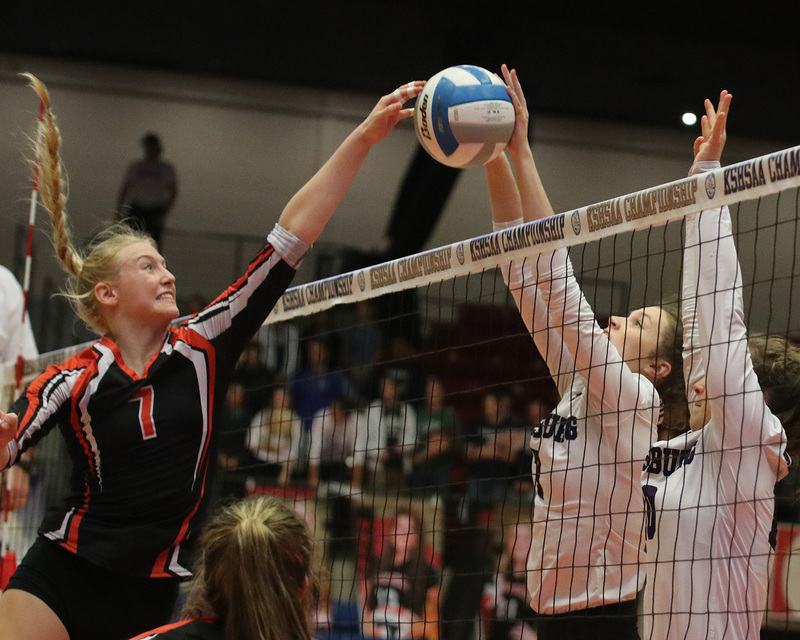 Louisburg had hoped to get a little revenge on the biggest stage, but wasn’t able to gain momentum in either set. Before the championship, however, the Lady Cats were on the top of their game. In the state semifinals Saturday against Andale, they lost the first set 25-12, but came back to win the second 25-21 and then dominated the third set, 25-14. Louisburg’s Carleigh Pritchard (right) blocks and Independence player at the net. Pritchard earned all-tournament team honors with Anna Dixon. 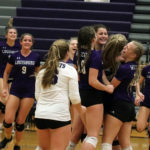 On Friday, Louisburg played some of its best volleyball of the season as it knocked off two defending state champions and the No. 1 seed in pool play to advance to the state semifinals. The Lady Cats battled two-time defending state champion Rose Hill and got some revenge from last season as it downed the Rockets 25-10, 25-27 and 25-23. Louisburg then went on to beat No. 1 seed Independence 25-16 and 25-20. In a match to determine seeding in the state semifinals, Louisburg squared off with defending state champion Topeka-Hayden in the final match of the day. The Lady Cats lost 20-25 in the first set, but rallied for a pair of 25-17 victories to finish pool play, 3-0. The Louisburg bench erupts after securing the win against Topeka-Hayden on Friday to finish pool play undefeated. Dixon had several big performances in her final outing as a Lady Cat. 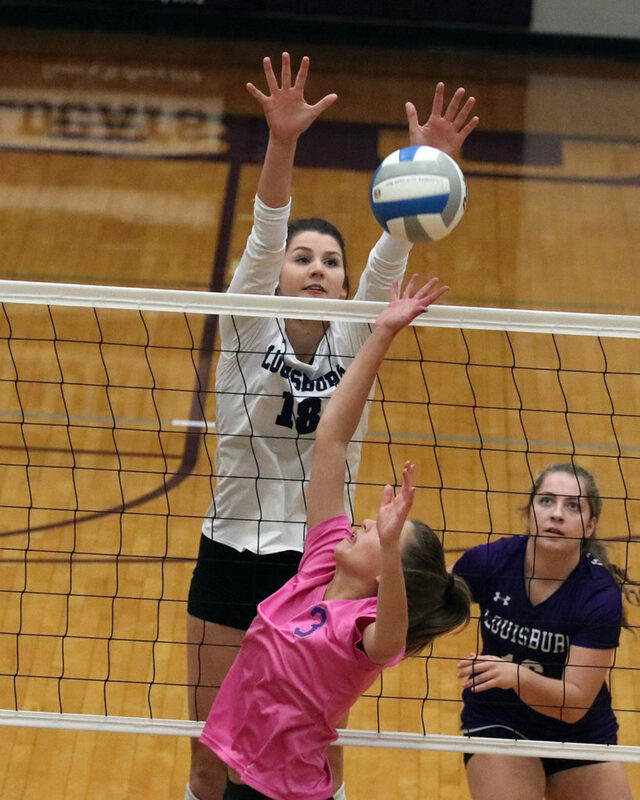 The Louisburg outside hitter led the way with 64 kills in the five matches, including a 22-kill performance in the semifinals against Andale and also had 21 kills against Rose Hill. She also finished with a team-high six blocks and was second on the team with 49 digs and five aces. 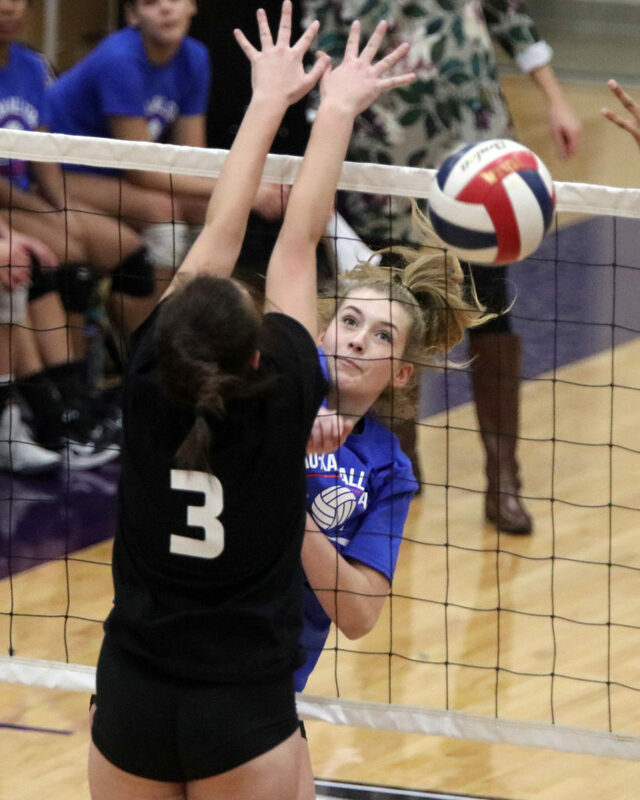 After the tournament was complete, the Kansas Volleyball Association released their all-state tournament teams. Dixon and sophomore Carleigh Pritchard earned tournament honors for their performance. Pritchard was second on the team with 24 kills and also had five blocks. Also at the net, junior Haley Cain had a big tournament with 22 kills, a team-high six blocks and she also finished with three aces. Buffington finished with 18 kills and three blocks in her final competition for Louisburg. Junior Riley Kallevig led Louisburg from behind the service line with seven aces and also had 10 kills, while junior Erin Lemke had 11 kills. Freshman Rinny McMullen celebrates a point Friday during pool play. 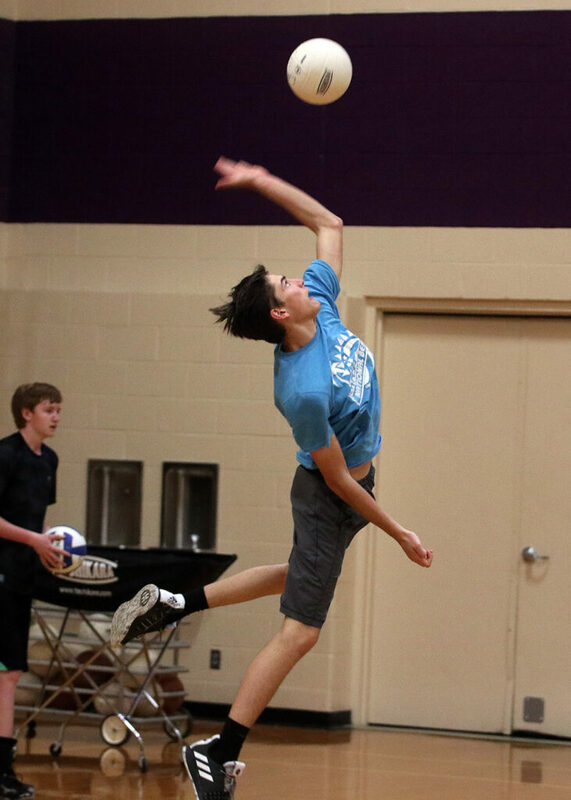 Louisburg got a strong performance from its two freshmen setters. Rinny McMullen ran the offense well with 80 assists and also shined on defense with 34 digs. Guetterman had 56 assists in the five matches and had 22 digs. 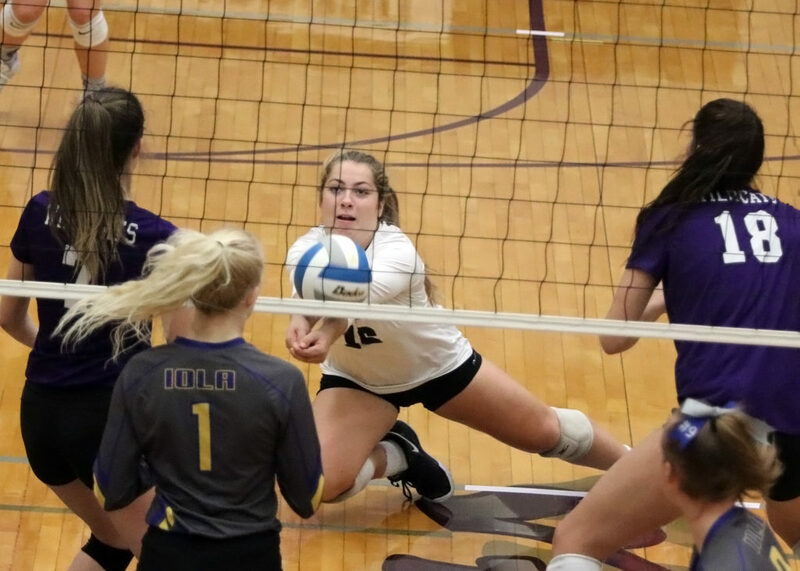 Defensively, junior libero Reilly Ratliff-Becher was busy in the back row with a team-best 56 digs and Kallevig had 29 digs, which was fourth on the team. “This team was just fun to coach and watch play volleyball,” Compliment said. “At times, they were a bit frustrating. For instance…our serving. We just liked to keep the game going at times. But when it really came down to it, they made the plays they needed to. We talked all season about starting and finishing strong. Throughout the season we had the tendency to come out slow. We did that a few times at state, bur for the most part we played pretty well. Junior libero Reilly Ratliff-Becher gets ready to return a serve Friday. As each Lady Cat player were given their state runner-up medal at the end of the tournament, the tears of ending their season with a loss was impossible to hold back. It was a special season that ended with a 36-9 record and second-place state finish. However, for some of the players, it was about more than wins and losses. “This season was the best volleyball season I’ve ever been a part of,” Buffington said. “The chemistry we had with each other was amazing. We all love each other so much, and because of that, we meshed so well together. We are all crazy and weird and it added to the fun. I’ll miss my best friends so much and I can’t wait to see how far they go in the years to come. Dixon’s Louisburg career also come to a close Saturday in Hutchinson. 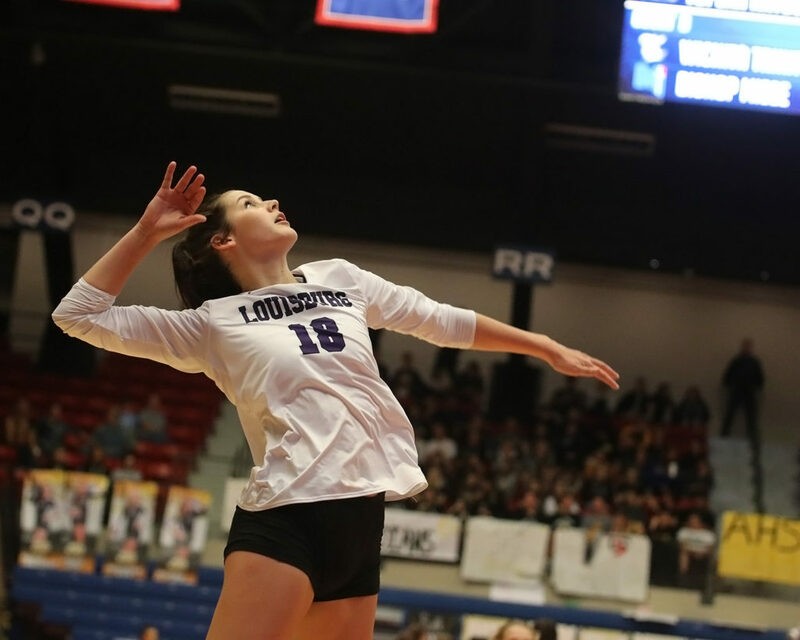 Although, she will still be wearing purple and white, the Louisburg senior will be suiting up for Kansas State next season to begin her college career. As much excitement as that brings, the thought of not playing volleyball for Louisburg anymore still hasn’t quite sunk in. Seniors Anna Dixon and Carson Buffington walk off the floor for the final time as Bishop Miege celebrates its state championship. 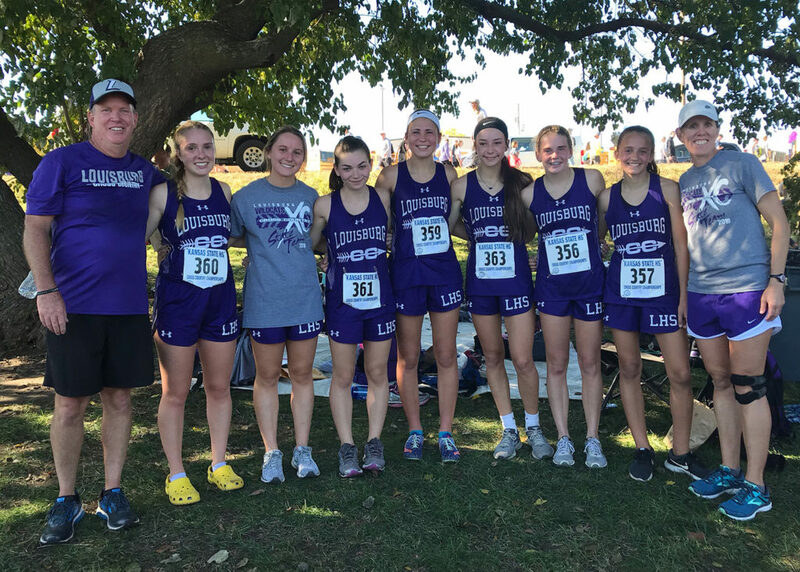 The Lady Cats have been one of the more dominant teams in Class 4A in the last decade as they have made the state tournament seven out of the last nine years and have finished as a state runner-up on three different occasions, along with several third and fourth place finishes. It is that success that Compliment hopes will drive them team into next season. Members of the Louisburg High School volleyball team run onto the court to celebrate their sub-state championship last Saturday in Louisburg. The Lady Cats open the Class 4A state tournament against defending state champion Rose Hill this Friday in Hutchinson. 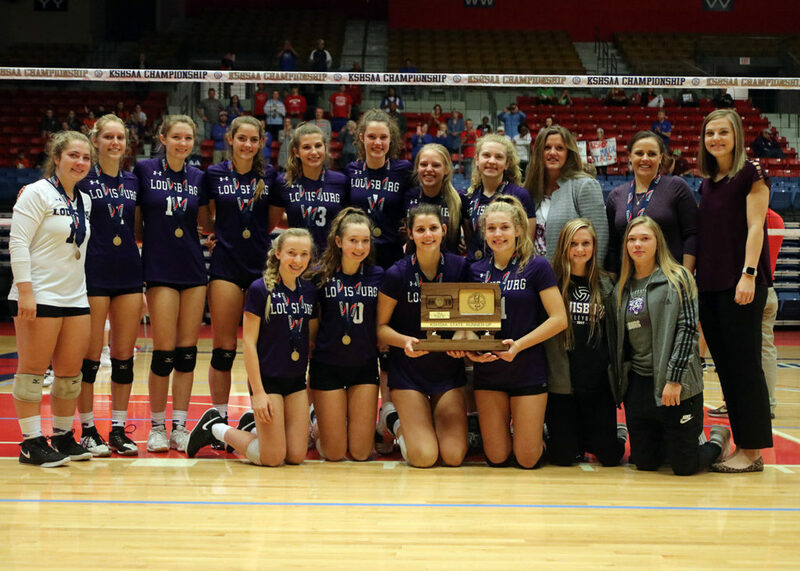 Throughout the offseason and into this season, the Louisburg volleyball team has always had last year’s state championship match fresh in its mind. The Lady Cats lost by two points to Rose Hill in the state title game last season, and the loss has been a driving force in their success this season. Louisburg won its seventh sub-state crown in the last nine years last Saturday in its 2-0 win over Eudora in the sub-state championship game, and on Sunday found out who it was going to play. The Lady Cats (32-8), which earned the No. 5 seed, won’t have to wait that long for their rematch with Rose Hill. They face the No. 4 seed Rockets (31-6) in the first match of pool play at 8:30 a.m., Friday in the Class 4A state tournament at Hutchinson Sports Arena in Hutchinson. 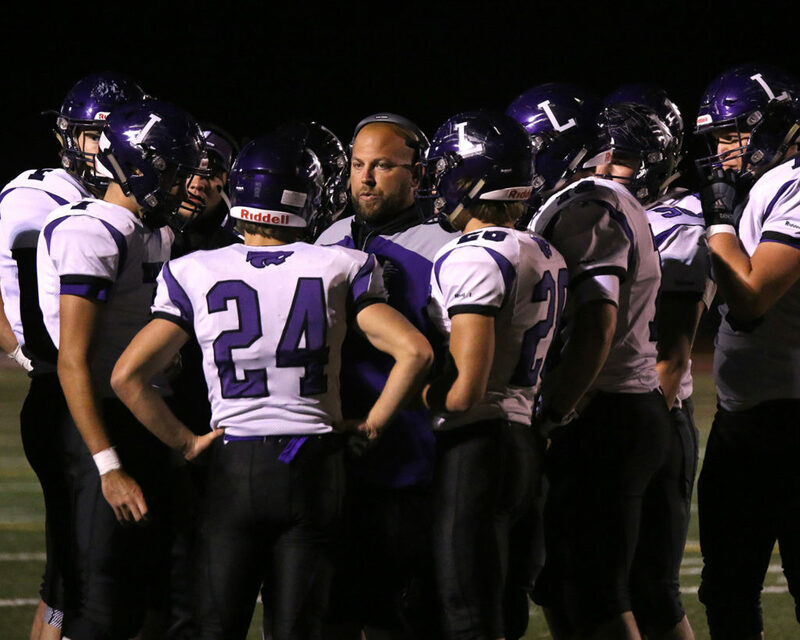 What Louisburg will see Friday is several difficult opponents. Not only will the Lady Cats square off with the defending state champion in Rose Hill, Louisburg will also face No. 1 seed Independence (37-2) and No. 8 Topeka-Hayden (21-17), who is a three-time defending state champion in the former Class 4A-Division II. The Lady Cats will meet Independence at 11:30 a.m. and follow it up with their match against Hayden at 12:30 p.m.
Carleigh Pritchard and Anna Dixon combine for a block Saturday during the sub-state tournament. No. 2 Chanute (33-6), No. 3 Andale (32-6), No. 6 Wichita-Trinity (22-15) and No. 7 Bishop Miege (21-16) are in the other pool. The top two teams in each pool will advance to bracket play at 10 a.m. on Saturday. “We were a little a nervous when the seedings came out, but yet excited at the same time,” Dixon said. “Rose Hill ended our season last year in the championship game and we have the opportunity to send them home after day one. The first match of the day against Rose Hill could be a pivotal one for the Lady Cats as they want to get started strong and not have the pressure of playing from behind to make sure they get to Saturday. Senior Carson Buffington celebrates a point last Saturday during the sub-state tournament against Iola. The Louisburg-Rose Hill match-up brings even more intrigue as it will feature two of the best hitters in the state of Kansas. Dixon, who will attend K-State next season, will go up against Rose Hill’s Gracie Van Driel, a University of Kansas commit. 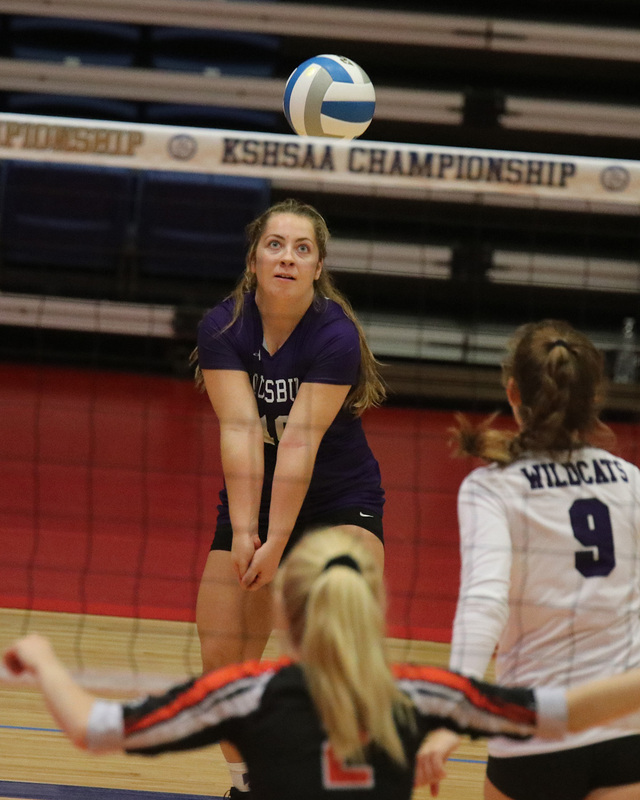 Dixon and Van Driel were selected as Co-Players of the Year in Class 4A by the Kansas Volleyball Association and the Louisburg senior is excited for the matchup. Dixon herself has had another good season for Louisburg and currently has a team-high 510 kills on the year. She is also second on the team with 45 aces and 276 digs as an all-around player. However, all of the Lady Cats have taken a step forward this season, especially when it comes to their setters. Going into the season, Compliment decided to run a 6-2 offense, and handed the reigns to two freshmen setters in Rinny McMullen and Davis Guetterman. 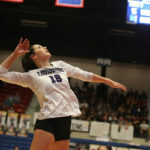 Compliment asked Buffington, who served as the team’s setter the last two seasons, to move to an outside hitter position and the change has worked out well for the Lady Cats. McMullen currently leads the team with 558 assists and Guetterman has 391. Freshman setter Rinny McMullen rises up for a serve last week. Both players are also among the team’s best servers. Guetterman is third on the team with 44 aces and McMullen has 35 on the year. “I don’t think a lot of people realize that both of them are freshmen,” Compliment said. 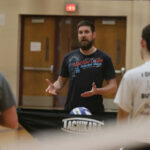 “I’ve had people come up to me, even at sub-state, and say ‘Your setters are freshmen? You can’t even tell.’ You can’t tell that when you watch them play and that is kudos to those two and the experience they had coming in. The Lady Cats also take pride in their defense, which changed up from last season. Reilly Ratliff-Becher took over the libero spot from Riley Kallevig and Kallevig moved on to play all six rotations. Kallevig leads the team with 296 digs on the season, while Ratliff-Becher is third on the team with 274. Kallevig also has a team-high 69 aces and both players are key in the back row with Dixon, along with McMullen and Guetterman. 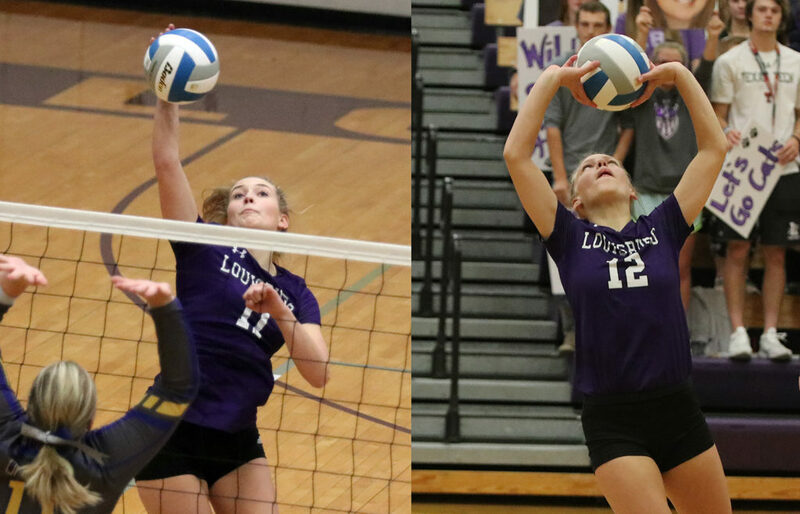 Louisburg has also improved at the net throughout the season as junior Haley Cain and sophomore Carleigh Pritchard have emerged as big hitters in the middle, and also on defense. Cain is second on the team with 169 kills and Pritchard has 119. Pritchard also leads the team with 45 blocks. Junior Haley Cain goes up for a kill during the sub-state championship match against Eudora. 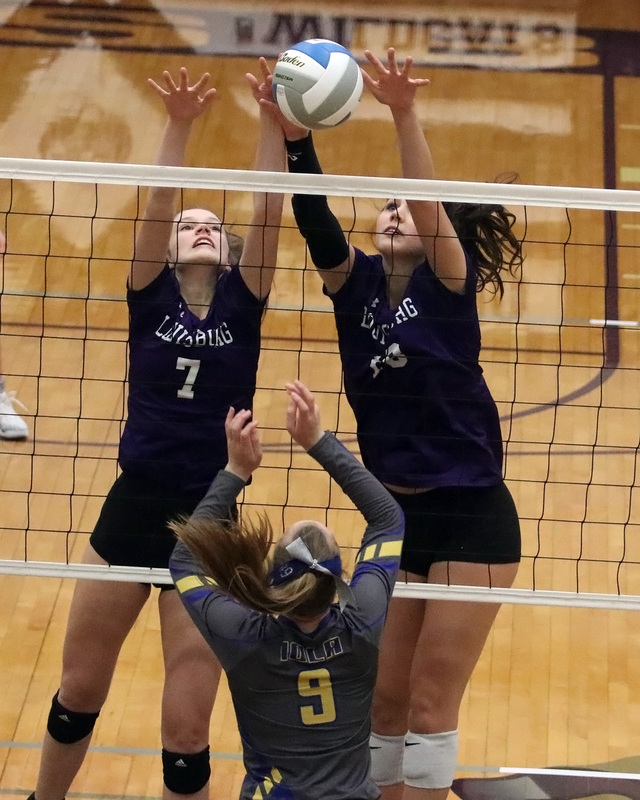 On the outside, Buffington, Kallevig and junior Erin Lemke also give the Lady Cats good hitting options as they have combined for more than 300 kills on the season. 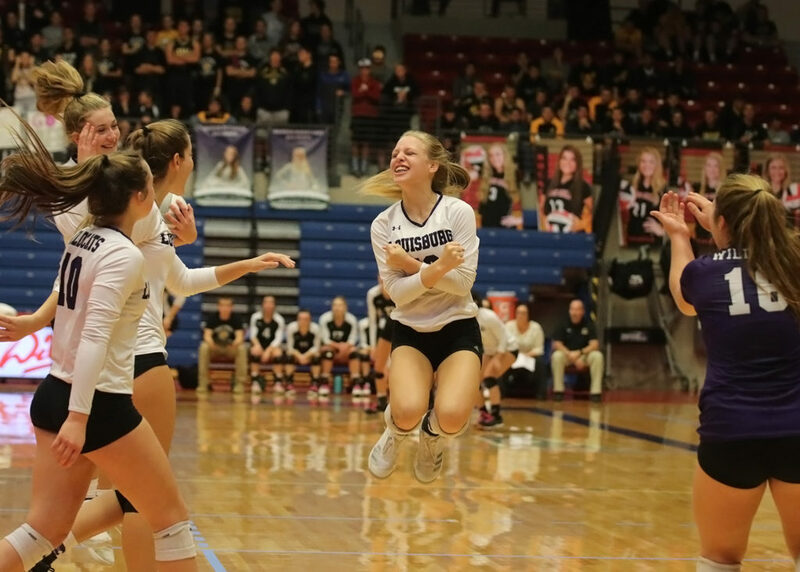 Even with all the success and big wins they have posted this season, the Lady Cats realize the stakes are high and are hoping to bring home the school’s first state volleyball title. They just need to have the right frame of mind. Louisburg senior Anna Dixon holds the Class 4A sub-state championship trophy up high following the Lady Cats’ 2-0 win over Eudora in the title game Saturday at Louisburg High School. 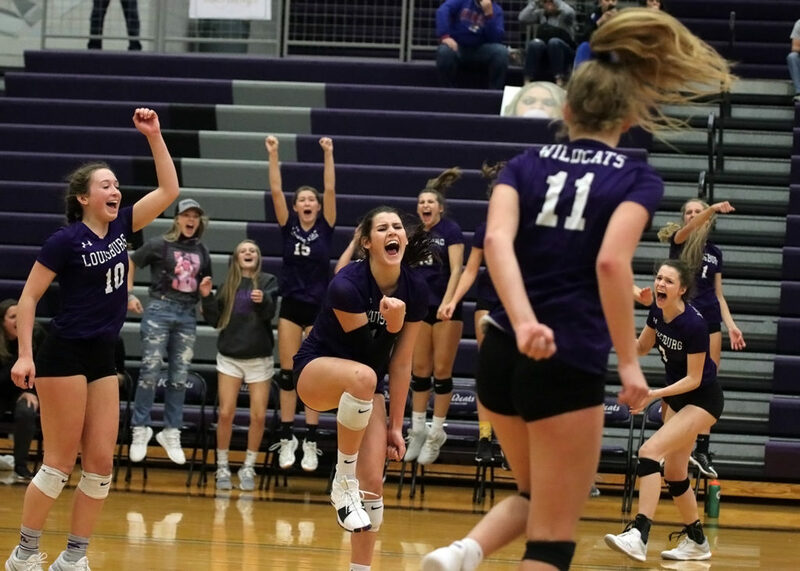 The last time the Louisburg volleyball team hosted a sub-state tournament, the Lady Cats had to watch an opposing team celebrate a trip to state on their home floor. It was a thought that was never too far from some of the players’ minds. Dixon and the rest of the Lady Cats made sure it didn’t happen again. 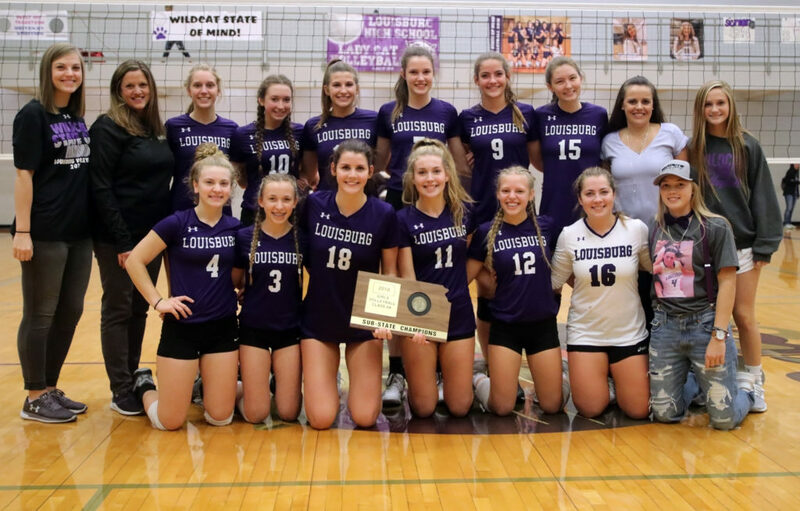 Louisburg captured its seventh sub-state tournament title in the last nine seasons as the Lady Cats defeated Iola, 2-0, in the sub-state semifinals, before downing Eudora, 2-0, in the championship match on Saturday at Louisburg High School. The Lady Cats, who are the No. 3-ranked team in Class 4A, will get another shot at state championship this weekend in Hutchinson. Louisburg (32-8) didn’t face much resistance to start the day as the Lady Cats controlled the match against Iola, 25-4 and 25-8, and came out strong from the beginning. Dixon finished the match with 10 kills to lead the Lady Cats and junior Haley Cain finished with four. Buffington and sophomore Carleigh Pritchard each added three. Offensively, they also served well from behind the service line as the Lady Cats recorded nine aces, including three each from Dixon and Cain. Freshman Rinny McMullen led the offense with 15 assists. On defense, Louisburg junior Riley Kallevig finished with a team-high seven digs and junior libero Reilly Ratliff-Becher added four. 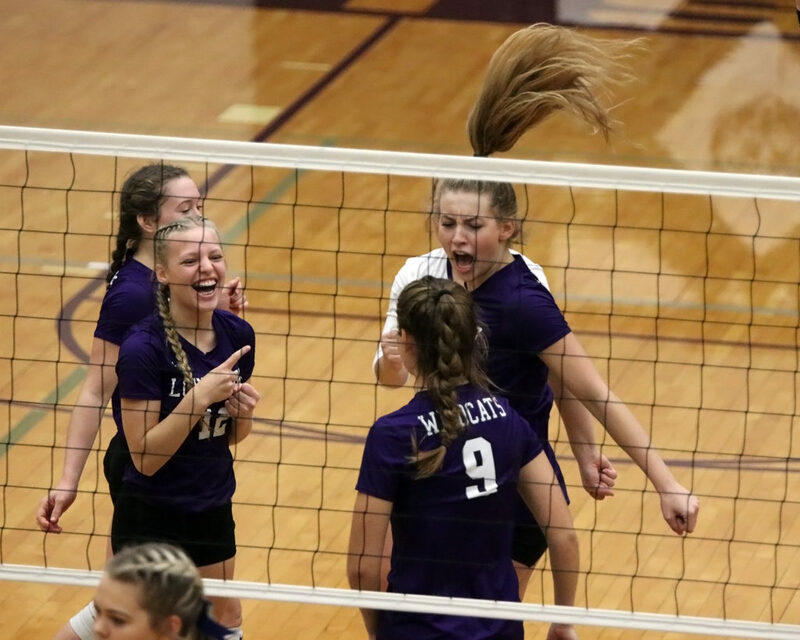 Louisburg’s (from left) Riley Kallevig, Anna Dixon, Carson Buffington and Carleigh Pritchard erupt with excitement after securing match point against Eudora on Saturday. It was much of the same in the first set against Eudora as the Lady Cats jumped out to a quick start and won the first set, 25-14. The second set was a little different as Louisburg had to face some adversity. Eudora looked like as if it was going to force a deciding third set as the Cardinals held an 18-13 lead late. That was until McMullen got behind the service line as she recorded five straight service points to give Louisburg the lead and it wasn’t going to let it go. The Lady Cats went on to take the second set, and the match, 25-22. “Rinny stepped up big and it all started with her serving,” Compliment said. “It took Eudora out of their offense and kept them guessing on what they were going to do. It just helped us dig out of it. Freshman Davis Guetterman sets up teammate Erin Lemke for a kill with the student section cheering behind her. Dixon had another big showing for the Lady Cats offensively as she finished with a team-high 12 kills and Cain was second on the team with seven. McMullen had a team-best two aces and 13 assists, while fellow freshman setter Davis Guetterman added 12 assists as both players distributed the ball well offensively. Pritchard also had four kills and a team-high two blocks for Louisburg. Freshman Rinny McMullen runs down a ball to keep it in play Saturday against Eudora. On defense, Kallevig and Ratliff-Becher both led the team with six digs each, while Dixon and Cain both had five. It was a defense that also came up big late against Eudora. 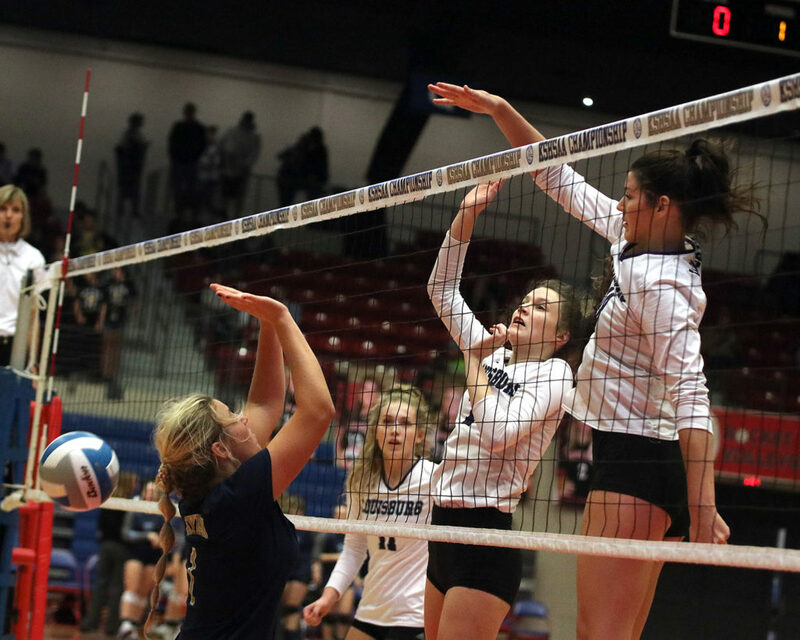 Although they didn’t necessarily like trailing for much of the second set, the Lady Cats hope to turn it into a positive that they can use for even bigger stakes this weekend. Reilly Ratliff-Becher dives on the floor to dig up a ball Saturday against Iola. 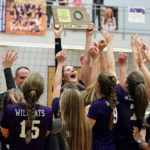 Louisburg, which finished as the state runner-up a season ago, will try for the program’s first state title beginning Friday during the Class 4A state tournament at Hutchinson Sports Arena. The Lady Cats, which earned the No. 5 seed, will start pool play against No. 4 Rose Hill (31-6) – last year’s state champion – at 8:30 a.m. on Friday. Louisburg will then play No. 1 Independence (37-2) at 11:30 a.m., and No. 8 Topeka-Hayden (21-17) at 12:30 p.m. The top two in each pool will advance to bracket play at 10 a.m. on Saturday. Members of the team (front row, from left) are: Davis Guetterman, Chase Kallevig, Anna Dixon, Carson Buffington, Rinny McMullen, Reilly Ratliff-Becher, manager Bailey Kern; (back row) assistant coach Leanna Willer, assistant coach Mary Quinn, Erin Lemke, Riley Kallevig, Alyse Moore, Carleigh Pritchard, Haley Cain, Sydni Keagle, head coach Jessica Compliment and manager Cameron Rogers.